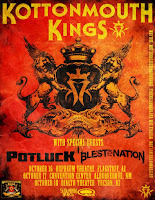 BLESTeNATION Heads West: I enjoy KMK shows, and I've been a fan of Blestenation for years, so I'll try to go to one of these shows. Big props to the guys for signing with Subnoize. If you haven't heard BLESTe before, check out their videos. 'Blestenation is heading out to Arizona and New Mexico in October to hit the stage with the Kottonmouth Kings for a few special shows.